The Tunnelers is Now Available! When a traumatized mining foreman is placed under the psychiatric care of Dr. Vincent Armstrong, the doctor thinks he has started just another shift. But as the victim begins to remember what drove him temporarily insane, Armstrong’s interest becomes personal, and he makes a series of discoveries that threaten to tear apart his carefully constructed scientific view of the world, and show in horrifying clarity that his patient is anything but delusional. Please drop on by and check it out! Solstice Publishing will be at BookExpo America (BEA) in New York City from May 23rd to 26th. This is a major annual trade show where authors, retailers, and English-language publishers large and small can network. 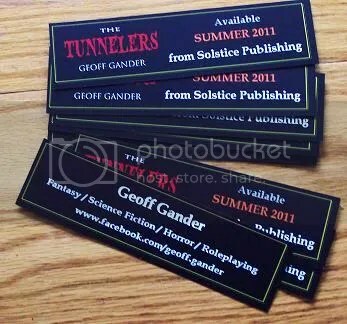 Although a number of Solstice authors will be attending, those of us who couldn’t make it were still given an opportunity to send promotional materials that will be given out at the booth. I’ve never really done this sort of thing before, but as far as opportunities go I felt this was something that really couldn’t be missed, especially because The Tunnelers is very close to release. As far as first attempts at designing promotional bookmarks go, I’m quite satisfied. I just got them this morning, and mailed most of them off right away. May they find their way into many hands!